Real estate news. Local updates for Cincinnati and Dayton, Ohio, Northern Kentucky and Southeastern Indiana. When it comes to real estate market trends across the country, one of the most popular today is the outdoor living space. This means taking a bit of what makes the inside of the home so special and moving it outside, so homeowners can entertain throughout the summer in the beauty of their own backyards. An outdoor fire is the perfect addition to any outdoor living space and it can serve to compliment a design or be the focus of it. For example, one economical option is the fire pit. Beyond the fire pit, which can be purchased and placed in the outdoor space with ease, some homeowners are contracting with landscape and hardscape companies to build a fireplace into the patio or yard itself, creating a welcoming sitting area for relaxing and entertaining. One of the most American backyard past times is grilling. 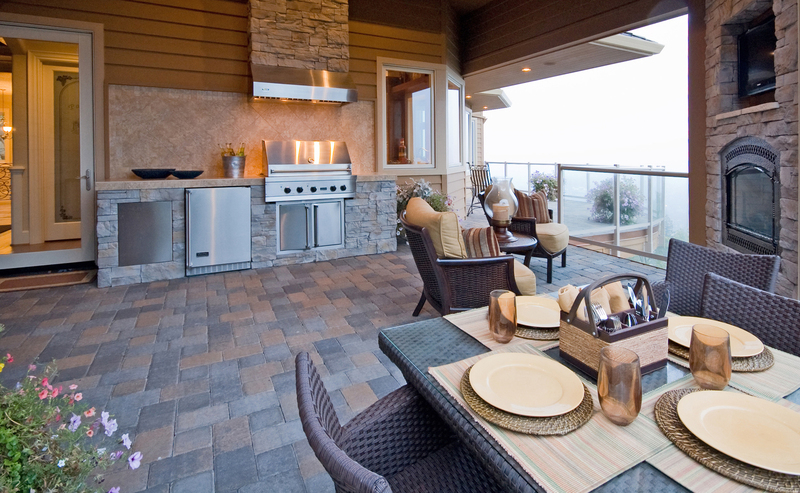 With a full outdoor kitchen, today’s homeowners are taking grilling to a whole new level of outdoor cuisine. In addition to a grill, homeowners can install a sink, a stove and an eating area. Many homes now have outdoor counters as well, often connected to an interior kitchen window. This way, guests can relax outside while the food is prepared in front of them. Pairing indoor and outdoor spaces is a popular home design trend. For example, some homes come with large double doors that seamlessly connect the indoor living room with the backyard patio. When opened, these doors blur the lines between inside and out, making for an exciting and relaxing living area (not to mention the illusion of more square footage). While eating and entertaining are great, sometimes homeowners simply want to relax. This is where the outdoor lounge comes into play. The patio or deck can be upgraded with attractive outdoor furniture. There can be couches, chairs, coffee tables and more elements common to an indoor living room. With the wide array of outdoor fabrics available today, homeowners have plenty of options to match the design to their tastes. Adding a sound system with outdoor speakers completes the space and can transform it from a relaxing place of solitude to a late night party and back again with a press of a button. A backyard doesn’t have to be drab, dreary and overgrown. Instead, homeowners have the option to transform the space into an attractive outdoor living area. This entry was posted in House Trends, News and tagged DYI, outdoor living, outdoor spaces by susanaknabe. Bookmark the permalink. Reblogged this on Exit Stage Left.